Less than a four-hour flight from the UK is a land of cultural and scenic diversity. The golden sandy beaches of Morocco's coastal region of Agadir are perfect for enjoying the warm sun in this year-round destination. Morocco is a country of contrasts- discover the bustling souks of Marrakech, marvel at the spectacular Atlas Mountains and unwind on the excellent beaches. There's a reason that holidays to Morocco are so popular with so many, there's just so much to enjoy in this beautiful destination. 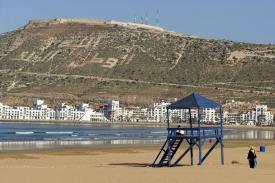 Agadir, with its mile after golden mile of golden sandy beaches has become its number one tourist resort. 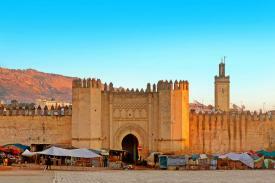 You can choose to fly from a number of UK airports to Morocco and your transfers are included too! This means you can enjoy a fantastic, stress free holiday in this sun-kissed paradise, staying in the best resorts and most popular hotels. Our signature 3rd week FREE offer is also available at a number of hotels so you can be certain you're getting the very best value when you book with us. We also have a selection of hotels in Agadir which offer no single supplements so you can enjoy the very best break without paying any extras charges. Away from sun-soaked shores of Agadir, there's plenty to explore. The highest mountain range in North Africa, the Atlas Mountains run diagonally across Morocco from the northeast of Agadir, finishing in Algeria and spreading over almost 1000 kilometres. With stunning peaks and valleys, the mountains are scattered with age-old villages, ancient ruins, markets and mosques. 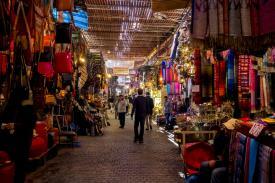 One of the largest cities in Morocco, Marrakech is divided into two distinct areas. The old town Medina is full of intertwining narrow passageways with local shops and markets full of character. In contrast, the modern Ville Nouvelle plays host to contemporary restaurants and is a mecca for shopping. This lively city is full of captivating culture, colours and activity. Just 45 minutes from Marrakech, this lush green valley enjoys a spectacular setting in the foothills of the Atlas Mountains. Famous for the seven waterfalls at Setti Fatma, the valley's tranquil landscapes are dotted with red stone village houses and calm rivers. After sampling the bustle of Morocco's cities, the Ourika Valley provides a taste of the country's untouched beauty. From the bustling souks of Marrakech to the golden beaches of Agadir, Morocco is an incredible holiday destination with so much to offer.